"I used to worship the guy." 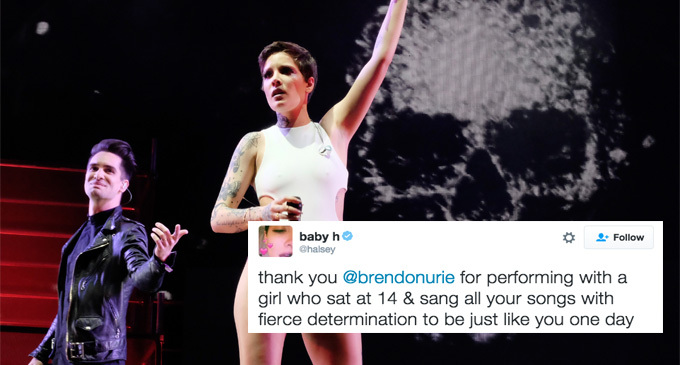 In case you missed it, Halsey almost broke the internet a few week back when she brought out Brendon Urie on the first weekend of Coachella for a duet of "New Americana" and Panic! classic "I Write Sins Not Tragedies". Now, the 'Castle' singer has spoken out about what it was like to meet her "hero" and it's about to make your heart MELT. "Brendon has had a massive impact on me as a writer and as a performer. A lot of the reasons why I sing the way I do, why I dance the way that I do why I write lyrics the way that I do, is because of how much I loved Panic! At The Disco," Halsey said. "So, to get to bring Brendon out on stage at Coachella was just a full circle moment." "Some people say don't meet your idols, but I think I did OK with this one."